A new method could help scientists understand how wildlife populations are affected by major natural events, such as hurricanes, severe winters, and tsunamis. The approach suggests the 2011 tsunami had an unexpectedly limited impact on organisms living in the intertidal zone of the Japanese shoreline. Conservationists and ecologists need to be able to predict the impacts of extreme natural events on species, and to improve their understandings of how these events influence natural selection. However, the physical units used to describe natural events–such as wind speed for hurricanes, wave height for storms, and moment magnitude for earthquakes–vary widely, making it impossible to directly compare their intensity. Wildlife populations also normally fluctuate over time, impeding the ability to judge an event's severity by looking at population size changes immediately after an event. Hokkaido University researchers in Japan came up with an approach that uses a single unit of measurement, called a "return period," that describes how often a particular type of natural event is likely to occur and how long it takes for a species' population to rebound after an extreme event. This allows both metrics to be plotted against each other on a graph, revealing key patterns. 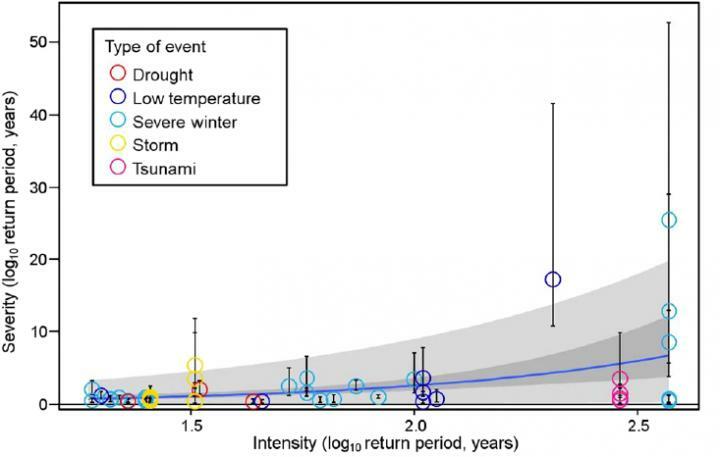 The researchers plotted the return periods of 27 natural events that occurred between 1946 and 2011 against the severity of their impact on 50 species. They found that wildlife populations were not affected by infrequent intense events in the same way they were affected by more frequent but weaker ones. Events that are frequent, relative to the lifespan of an organism, probably exert a strong selection pressure on species to evolve resistance against them, the researchers say in their study published in the journal Scientific Reports. Their findings suggests the 2011 tsunami had a relatively small impact, comparable to a Pacific storm in 2006, on inhabitants of Japan's rocky tidal shoreline, such as mussels, barnacles, and algae. "This unexpectedly limited impact could be because the tsunami only lasted a few hours. A storm in 2006 off the coast of Tohoku lasting several days has a similar impact on the tidal zone species as the 2011 tsunami. Such storms occur much more frequently than tsunamis," said Takashi Noda of Hokkaido University who led the study. The team emphasized that long-term censuses of organisms are urgently needed to improve predictions of how natural events will affect them.